Bacon wrapped guac stuffed burgers! 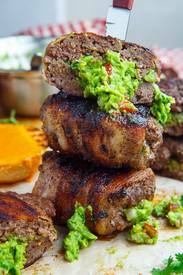 It time for some more outdoor grilling fun with these Bacon wrapped guacamole stuffed burgers! Bacon and avocados are two of my favorite foods and when you combine them in the form of burgers and grill them up until crispy, smoky, charred, juicy and oh so good, they are nearly irresistible! These burgers could not be easier to make!